You know the trademark white swirly logo for its iconic, ever-green sophisticated writing instruments....but did you know that Mont Blanc carries a distinguished fragrance line for the men that use them? In line with its prior contemporary fragrances, Legend Intense continues that timeless and sophisticated signature of the original fragrance, Legend; but refreshed into a warmer and more intense sensual version. The Boyfriend, being a man of discerning taste in scents was perhaps the best partner I could have in my first men's fragrance launch, and no better person to test out the new scent! In line with the elegant original design of Legend, the new Legend Intense bottle embodies luxe and masculinity: Encased in a gun-metal whisky-flask looking bottle, complete with the classic Montblanc emblem on the cap. Distinguishing itself from its predecessor Legend, the "Intense" logo is in a red logo stamp which signifies a warmer, richer and fuller scent. "The Legend Intense is a retelling of a classical tale in a different way. It’s a celebration of the seductive power and charisma of the sophisticated man with an unforgettable signature. Of differences that distinguish a man and a perfume inimitable. " Created by fragrance industry name Olivier Pescheux (who is known for his work with the Annick Goutal perfumes) begins with a fresh burst of raw fern harmony at its top note, coupled with the spicy dashes of cardamom and Pepperwood. The heart note is a surprisingly feminine ingredient: a medley of clear jasmine, white cedarwood, Pomarose (a superior fruity odorant) and red apple. A fresh and woody scent that is full and rich, yet reflecting mysterious virility and sensuality dash that leaves you questioning. The scent is anchored by Evernyl (a rare ingredient derived from a lichen found in oak trees), is a woody oakmoss), the raw material of Montblanc Legend, and the olfactory pull of tonka bean, to give that potent yet understated dimension. What the Boyfriend had to say about it: It's rather strong when you first spritz it, hence I like it better when it mellows out after minutes. I like the bottle because it looks classy, although I feel that the scent is not as lasting as I hope it to be, with it fading within an hour (but then again it could be the personal reaction with my body). But overall, I like it although June's mum feels that I'm rather heavy-handed in spritzing due to its lighter notes. 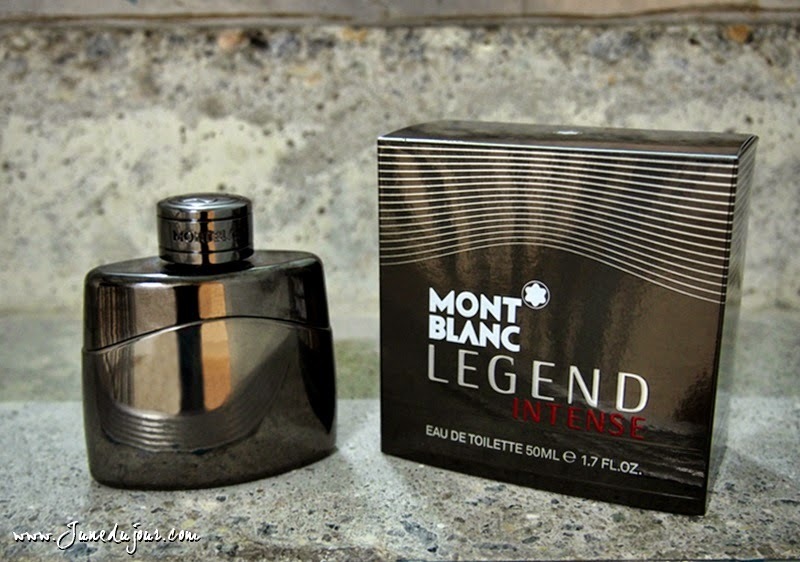 Mont Blanc Legend Intense EDP (100ml) is priced at SGD132 while the smaller bottle (50ml) is retails at SGD 99; and is currently retailing at all Sephora Stores as well as Takashimaya.